Today’s consumers are using the Internet and social media for both personal and professional activities, and they’re savvier than ever about the way companies like yours are trying to reach them. Though they’re inundated and overwhelmed by blatant advertising that tries to pull at their attention, they now tune out most ads, especially the ones that aren’t relevant to them. Your customers and your prospects want you to be available to them whenever they go online. Just as they expect a search engine to give them instant results for information they’re seeking, consumers who go online to search for your company expect that you’ll have not only a website but also a presence on at least one of their favorite social networks. Add social media icons representing the social networks where your company is present and participating, including links directly to each network so that visitors to your website can connect with you in the way they prefer. 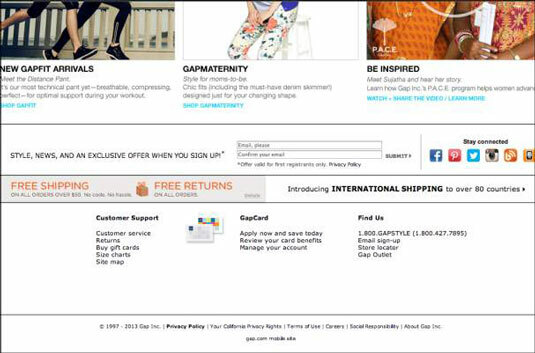 You can see that The Gap embeds social media icons in the footer of its website so that they appear on every page. Hear them when they praise you: People willingly post both positive and negative statements publicly about you, your products, services, or company on their favorite social networks. You need to listen. Respond quickly: If someone comments about a company online, that person expects a response — and may instantly receive responses from their friends, fans, and followers. You want to be part of that conversation. Provide a forum for them: Calling a 1-800 customer service line is no longer the way consumers want to ask questions, air grievances, or lavish praise on a company. Your presence on a social network can provide customers with a new way to communicate with you. It may seem intimidating, but they want to communicate with you publicly. Offer communications choices: Consumers want multiple options for connecting with you. Offer them a variety of options based on their preferences. In short, the very people whom you’re trying to reach — your target market — are expecting you to be present in major social networks and not only to lurk there but also to be ready to interact with them.